The Weissenhof Estate (Weißenhofsiedlung) is an estate of working class housing which was built in Stuttgart in 1927. It was an international showcase of what later became known as the International style of modern architecture. The estate was built for the Deutscher Werkbund exhibition of 1927, and included twenty-one buildings comprising sixty dwellings, designed by sixteen European architects, most of them German-speaking. The German architect Mies van der Rohe was in charge of the project on behalf of the city, and it was he who selected the architects, budgeted and coordinated their entries, prepared the site, and oversaw construction. Le Corbusier was awarded the two prime sites, facing the city, and by far the largest budget. The twenty-one buildings vary only slightly in form, consisting of terraced and detached houses and apartment buildings, and display a strong consistency of design. What they have in common are their simplified facades, flat roofs used as terraces, window bands, open plan interiors, and the high level of prefabrication which permitted their erection in just five months. All but two of the entries were white. Bruno Taut had his entry, the smallest, painted a bright red. The estate was designed with tenant participation, and a streamlined building process in mind. Advertised as a blueprint for future workers' housing, in fact each of these houses was customized and furnished on a budget far out of a normal workers reach. The exhibition opened to the public on July 23, 1927, a year late, and drew large crowds. Of the original twenty-one buildings, eleven survive as of 2006. 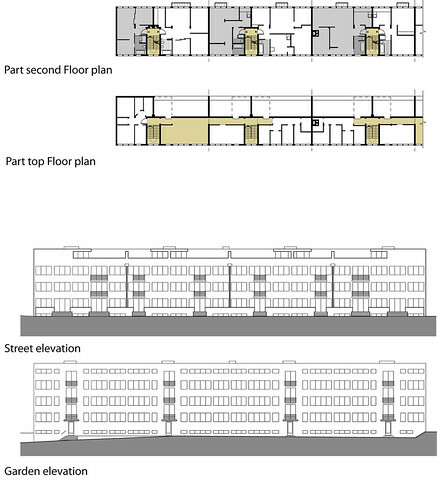 Lludwig Mies van der Rohe’s Weissenhofsiedlung apartment building dominates the site turns the traditional block outside in: instead of a perimeter block around a courtyard a thinner block sits alone, with flats extending through its full depth. The framed construction allowed flexibility with differing configurations of internal partitions. With the exception of the kitchen and bathroom there was no prescribed use of any of the other spaces therefore offering great flexibility in spatial arrangements. The building also allows for easy repetition and extension. The block is four storeys in height with rooftop terraces. Oud’s project is one of a series of designs for high density low rise terraced or row housing that he had been working on for several years. 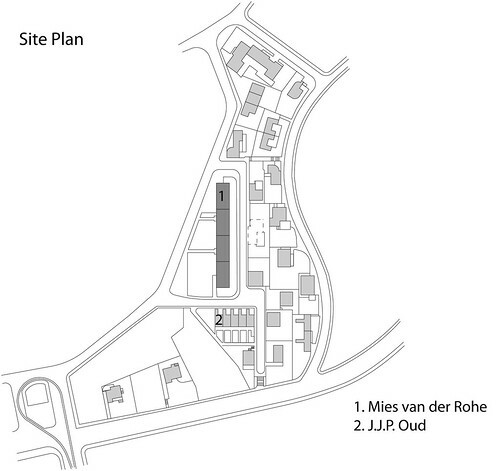 The scheme consists of five 3 storey houses each including a basement. The plans were narrow, only 4.7m but up to 8m deep. The floor plan creates a private entrance courtyard accessible from the street. In addition each house has another entrance overlooking gardens and a pedestrian street. 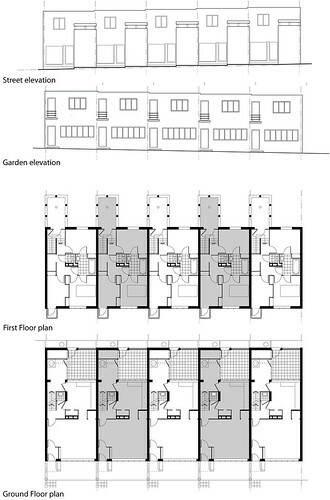 A bathroom with separate WC is provided, with a separate laundry room for each dwelling at ground floor together with a store room accessed from the courtyard.